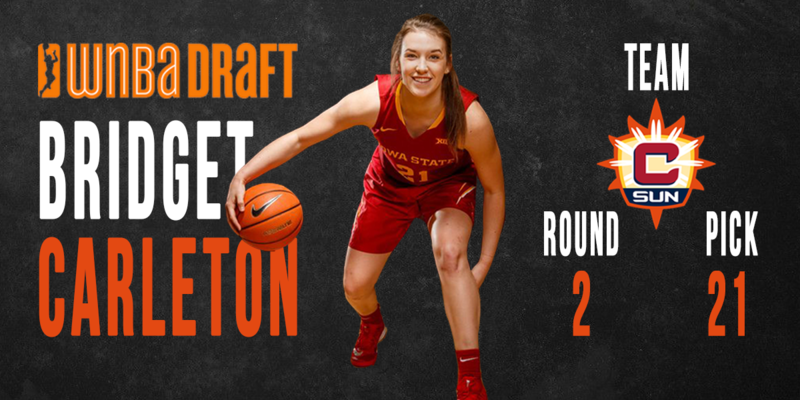 Chatham, ON native Bridget Carleton was selected with the 21st overall pick in the 2nd round of last night’s 2019 WNBA Draft. Carleton was a standout at John McGregor Secondary School before taking her talents to Iowa State, and now she’s off to the WNBA. In her impressive 2018-19 senior year with Iowa St. she walked away with plenty of hardware taking home the BIG 12 Player of the Year and the Cheryl Miller Award (awarded to the best Small Forward in the NCAA). Carleton led her club team to Division 2 Ontario Cup Championships in 2011 and 2012. She was a member of the Ontario U15 provincial team that won gold at the U15 National Championships in Winnipeg, MB. In 2012 she was presented with U15 Hazel Miner Award – presented annually to Femal Team Ontario athletes who, “uphold the finest qualities of sport in their pursuit of athletic excellence.” Lastly, in 2013, Carleton was a member of the Ontario U17 provincial team that won gold at the Canada Games. This is the 4th Team Ontario alumus to be drafted into the WNBA. Natalie Achonwa (Toronto, ON) and Kayla Alexander (Milton, ON) of the Indiana Fever, as well as Kia Nurse (Hamilton, ON) of the New York Liberty. You can catch Carleton and the rest of the Connecticut Sun in their first preseason game on Thursday May 23rd starting at 7:00 p.m. from The Mohegan Sun Arena in Uncasville, Connecticut.